It’s come to my attention that it’s almost four years since I wrote my one of my first Pro Tools Expert articles - Five Reasons I Use A Windows PC For Pro Tools. This also coincides with it now being six years since I set up 8dB Sound and made the decision to base it mainly around Windows technology. Looking back at my article, I’m not struck by how much has changed, but more by how much has stayed exactly the same. In this article, I’m going to take a look back at my original reasons and see how they stack up now. 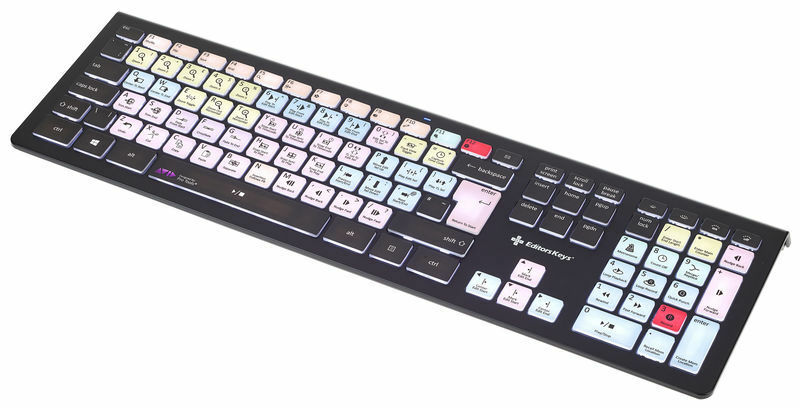 I completely stand by this, but now I would say not to bother swapping your keyboard for an Apple model - the excellent Editors Keys range can really help with the transition. Four years on and Windows 10 is now with us. The plug’n’play support is vastly improved and as my server build article demonstrated, a clean Windows install is now a swift and painless operation, and none of my pro-audio software has been dramatically affected by Windows updates. It’s still very rare to get BSOD lockouts. If it does happen, nowadays it can include a QR-code that you can scan with your phone to get more information about what fault has caused the issue. Unfortunately, WASAPI support with video is still not working and there aren’t any signs of it being fixed yet. 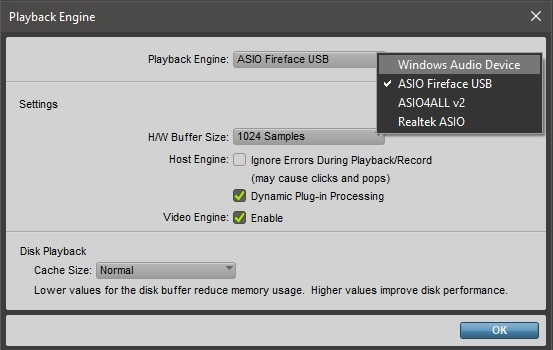 ASIO is still the best way to connect audio interfaces to your Windows Pro Tools system. One major change in my rig since then is that I have replaced my MOTU audio interface with an RME FireFace802. RME have some of the best most reliable drivers out there and using just the USB2 connection, the RME has performed incredibly, with low latency and rock solid stability. This is why it’s important not to sling the blame at Windows first, if you do get issues. This is still the case, though you can now add USB-C and Thunderbolt 3 to that list. Indeed I can simply and cheaply upgrade my system to these two standards with a sub £100 card. Despite specifying my current system with dual Thunderbolt 2 (a rarity on Windows systems), I really haven’t used it an awful lot. This is because of all the other connection possibilities available and the availability of rock solid drivers as mentioned earlier. Since moving all “spinning” media to my server and having a decent amount of SSD storage locally, I’ve found the need for the ability to read non NTFS drives on my main system has decreased. Nowadays I mount incoming physical media on my server first, virus scan it, then copy it across to my “work” local storage over gigabit ethernet. This in my opinion is where there has been the biggest change in the Windows DAW experience. As my review of the Dell Inspiron Windows Laptop showed, the introduction of USB-C and Thunderbolt 3 to Windows laptops has completely reversed this situation. Now you can get off-the-shelf MacBook Pro beating performance and user serviceability/upgradeability for far less money than an equivalent Apple device. Just how far Pro Tools on Windows laptops has come was reinforced recently when I was mixing a 26-part series in 5.1. I was mixing the episodes in my own studio just outside Bristol then final reviewing them with the client in London. 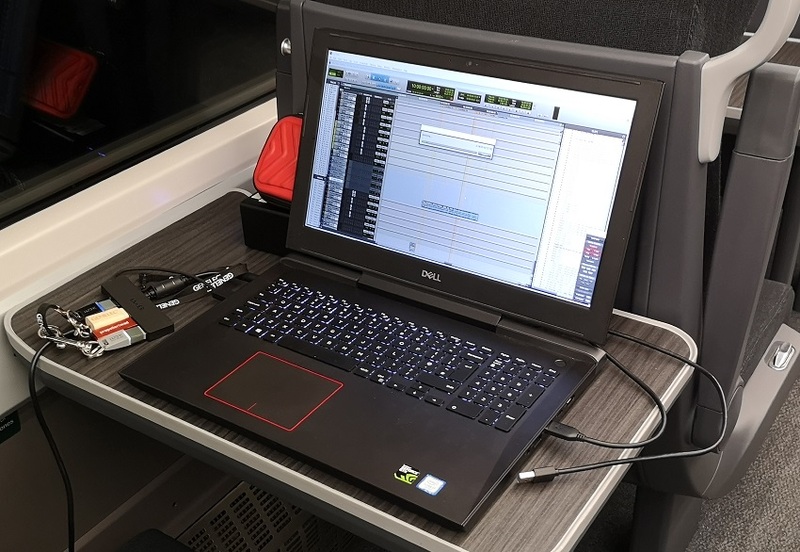 During my two-hour commutes each way on the train, I was making the numerous deliverables using my Windows Pro Tools laptop system, connected to 2TB of SSD storage via a USB-C caddy. What was shocking was that my laptop was able to bounce multiple 5.1 stems out to disk from a 200+ track session with lots of live plug-ins, more than three times faster than the review studio’s MacPro 5.1 could. This is because the Windows laptop has the latest high speed connectivity and a far superior GPU. That isn’t to say though that I haven’t kept my toe in Apple waters. Since losing my MacBook Pro, I have built a “Plan B” machine, which doesn’t run Windows as its primary operating system. As its name suggests, I mainly built it as a back-up system in case of emergency, but also due to the now decreasing amount of software that doesn’t run on Windows. Indeed I now only really have two software suites on my Plan B system that I don’t have on my Windows systems and I’m assured that both of these have Windows versions in rapid development. Here’s the thing - since writing that article four years ago, my core hardware hasn’t changed. I also haven’t got any reason to change or upgrade that hardware - I aimed high to begin with and that small extra investment in wisely chosen hardware has paid dividends. Now, Intel have gone up to i9 processors, but with this latest generation of chips, more advanced features such as hyper-threading have slowly filtered down into the lower range of processors. You can get motherboards with multiple M2 drive connectors, Thunderbolt 3 and 10G ethernet now. My advice from experience though is that Asus motherboards, in particular the older X99 series, provide excellent compatibility, value for money and reliability. This is still very much the case, as my experience with my Windows laptop shows. Dell in particular have managed to spectacularly prove me wrong in this respect. The Dell laptop that I bought last year is very upgrade-able and user repairable and comes with an incredibly detailed instruction manual that takes you through all the steps. The innards are accessible with a single standard screwdriver and there are no specialist tools required. Since purchasing this laptop, I have upgraded the RAM from 16GB to 32GB and swapped the second “spinning” hard drive for a 1TB SSD. This reduces battery consumption, lowers heat and improves reliability. I was able to do this quickly and simply using just one standard tool - a Philips screwdriver. The above laptop is a case in point. My Dell Inspiron 7577 is indeed specified as a “Gaming” machine, in that it has a reasonably powerful GPU (graphics card) with a whopping 6GB of its own memory. What some Mac users may not realise, is that the more powerful your GPU, the slicker your Pro Tools will be as Mike showed when he upgraded his graphics card in his Mac Pro 5,1. The only optimisation that I use from the list recommended by Avid is to stop USB devices from being automatically powered-down. It is still possible to make Windows very clunky and ugly, but with today’s processors and GPUs, this really isn’t necessary any more. My persistent support for Windows has actually paid dividends. Only this week, I was approached by a client purely because of my devotion to the cause. They were re-assured that I would understand the platforms that their workflow is based upon. The vast majority of video editors, visual effects artists and video mastering facilities that I work with on a daily basis, in all genres from commercials to feature films, use Windows. An increasing amount of musicians I work with are also moving away from Apple. The reasons for this are simple - bang for buck and increased compatibility. Visual clients need to be able to take full advantage of things like NVidia GPUs and UHD video IO/acceleration which still use PCIe slots. With Adobe now supporting the Pro-Res format in Windows, this shift is further accelerating. I now wouldn’t really recommend a Hackintosh. With Apple using proprietary co-processors and potentially moving to Arm processors, plus Apple not supporting later NVidia GPUs, this field is becoming a lot more difficult. My current opinion is that this will bring you more technical stress and unreliability than an equivalent Windows based system. Just spending a few minutes on any of the Hackintosh social media forums reveals that a lot of users encounter daily show stopping issues. This still applies, but as our recent polls show, you now have an increasing amount of DAW users alongside you. I am somewhat of a veteran - my first Windows Pro Tools system was in 2005 and even then my Windows Pro Tools system was outperforming equivalent or even better specified Mac Pro Tools systems. Pro Tools on Windows is not quite at the tipping point, where support is as good as it is for Mac users, but it is very near the fulcrum, especially as there are some software tools that we use in audio post-production that are Mac only, though that number is steadily decreasing. As ever, my advice is, go for it, and remember that there are a lot of people, including on this blog, who can help. Are you a long term Windows Pro Tools user? 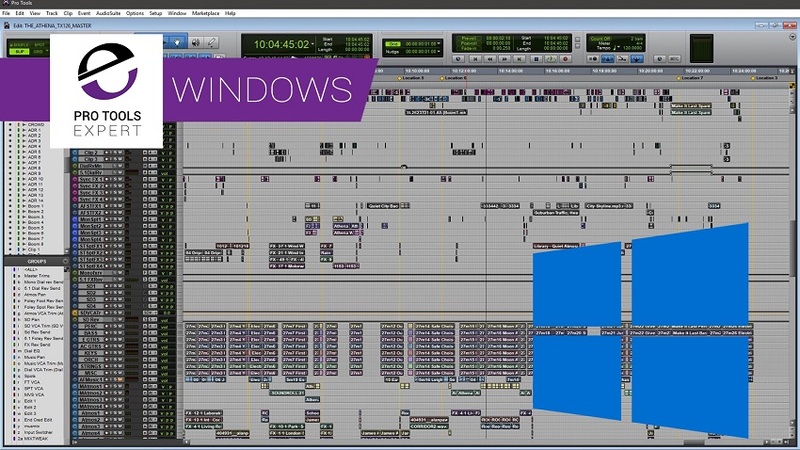 Or are you considering moving to Windows for your next Pro Tools system? Please share your thoughts in the comments section below. Does My Version Of Pro Tools Work With My Computer And My Operating System? Intel Announce New Compute Card - Will This Make The Best Mobile Pro Tools System and Replace Laptops In The Studio?